Explore the wilder south of France with this comprehensive guide to Languedoc and Roussillon’s wines and winemakers. Arguably the world’s biggest vineyard at around 300,000ha, the region is a treasure trove of excellent wines (at reasonable prices), strong winemaking personalities, historic sites and unique landscapes. This greatly expanded 2nd Edition covers over 500 wineries, châteaux and domains over 15 routes, and includes sites and sights to visit, plus suggestions of hotels, restaurants and the occasional café bar. Specially designed maps help you find the wineries, and the text gives you links to their websites, e-mail addresses and phone numbers. Choose between an Apple iBook version through the ‘iBook store’ button below, or a PDF version through the ‘Buy Now’ button below. ”Gorley has a way of making you feel as though he’s whizzing you down the A9 to take you to some places that he loves. It’s written in such a chatty style, casual, unapologetically personal. He also writes with quiet humour, so subtle you could easily miss it. But what I find most interesting is how this book seems to be marked with kindness. 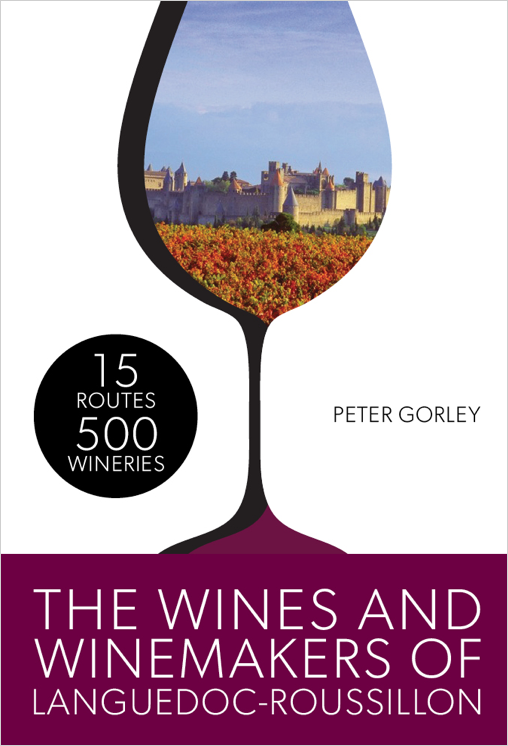 ”Gorley’s Guide is many things: a helpful and discriminating handbook on the wines of France’s most dynamic wine region: an intriguing and seductive introduction the the hotels, restaurants and notable sights of this beautiful, unexplored area; and a dazzling bit of scholarship. Gorley’s intimate knowledge of the wines, topography, and personalities of the Languedoc-Rousillon is obvious and imbues every page. He must’ve interviewed a hundred, maybe a hundred and fifty -of the region’s best wine producers and these are fun and informative.In addition, the book is highly user-friendly; enticingly laid out and full of colour pictures and handy itinerary maps. Whether you’re a wine fanatic hungry for detailed information or a would-be traveller considering an introductory trip to this most southerly part of France’s “Deep South” – Gorley’s Guide is heartily recommended. … his book directs you through the roads of Languedoc and on the way views the attractions of the area; he also recommends where to eat and relax; what more could you want from a book?